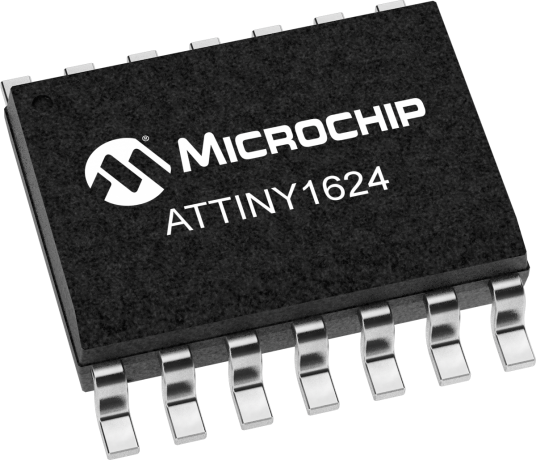 The ATtiny1624 is a microcontroller featuring the AVR® CPU with hardware multiplier - running at up to 20MHz and with 16 KB Flash, 2 KB SRAM and 256 bytes of EEPROM in a 14-pin SOIC package. The family uses the latest Core Independent Peripherals with low power features including Event System, intelligent analog and advanced peripherals. The new 12-bit ADC offers true differential measuring capabilities with optional hardware accumulation of up to 1024 samples, which effectively gives resolution up to 17-bits accuracy. With sampling rates up to 625 ksps in accumulation mode and 294 ksps in single conversion mode the analog data is available very rapidly. The Programmable Gain Amplifier (PGA) for the ADC can amplify single-ended and differential analog inputs to make it possible to measure even small amplitude signals efficiently.